In November, early-bird tickets were made available for the 2018 festival which are all sold-out, followed by the February announcement of the full lineup and general on sale. 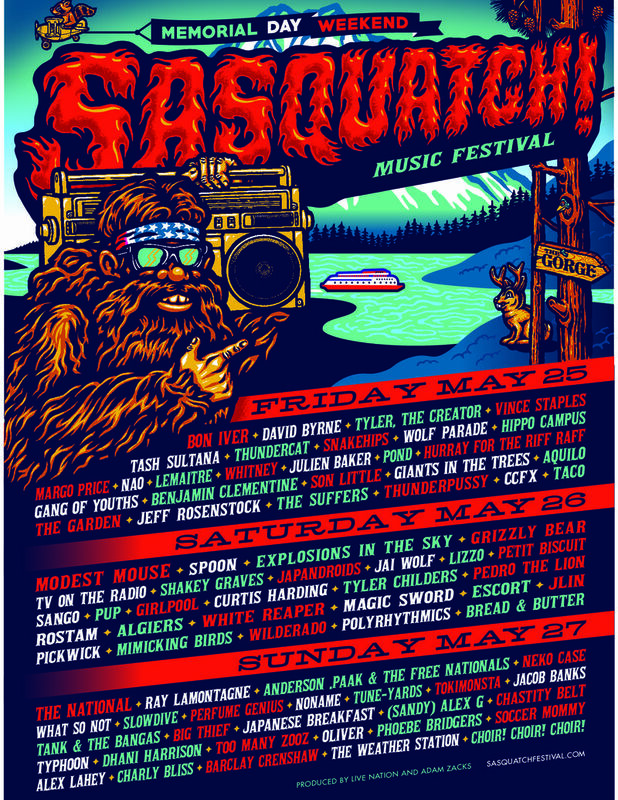 Single day tickets as well as 4-packs of festival passes and single day tickets are on sale at SasquatchFestival.com. The National, Ray Lamontagne, Anderson .Paak & The Free Nationals, Neko Case, What So Not, Slowdive, Perfume Genius, Noname, Tune-Yards, Tokimonsta, Jacob Banks, Tank & The Bangas, Big Thief, Japanese Breakfast, (Sandy) Alex G, Chastity Belt, Typhoon, Dhani Harrison, Too Many Zooz, Oliver, Phoebe Bridgers, Soccer Mommy, Alex Lahey, Charly Bliss, Barclay Crenshaw, The Weather Station, Choir! Choir! Choir!